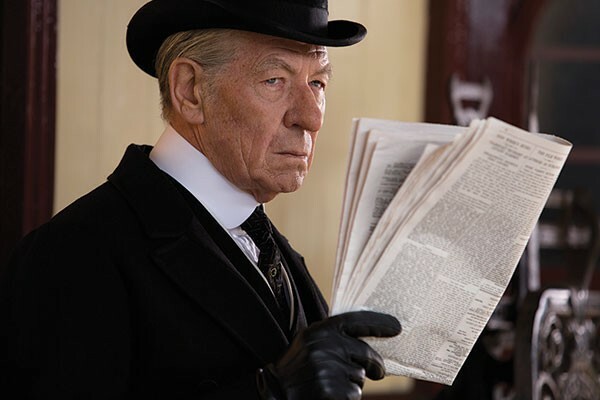 The light dramedy Mr. Holmes catches up with the famed Victorian detective Sherlock Holmes (Ian McKellen) as he spends his golden years at his country home. It's 1947, the war is over, and Holmes would just like to tend to his bees, and perhaps finish his account of one last case while his failing memory still cooperates. Fortunately, his housekeeper's young son, Roger (Milo Parker), steps in for the long-gone Watson, helping Holmes sort through his memories. Thus, Bill Condon's film, adapted from Mitch Cullin's novel, cuts between contemporary goings-on, Holmes' recent visit to post-war Japan, and the events of that case, unresolved for many decades. In fairness, everything is a bit jumbled in Holmes' mind: the mysterious, unhappy woman from his past, the eager Roger, bees, the still-fresh losses of World War II, and his own mortality. The various plots all come to together, and so, I'm afraid, do some obvious "valuable lessons" about life and love. While Holmes' wits are shaky but able, die-hard Holmsians should note: This is a series of interconnected stories that mostly eschew logic for emotion for their resolutions. It's a pretty mawkish stew that in lesser hands would relegate this to the cozy-tea-and-sweet-jam set. But, unsurprisingly, McKellen sells the hell out of this rather moony Holmes. Well-acted all 'round and with beautiful period detail, Mr. Holmes is a rather sweet change of pace for the prickly crime-solver.